Team Assessment is a 48+ Hour endurance event where you and your teammate will compete against other teams of two in a series of challenges outlined by the Cadre. One team will have the opportunity to win, if any still remain, and all teams that meet the standard will become official finishers. Physical demands will mimic those found in Special Forces Assessment and Selection. Your ruck must weigh minimum 45/30 lbs. at all times, not including water or food. 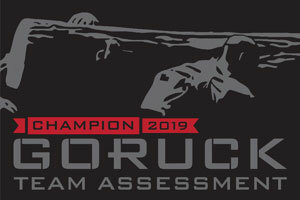 We will weigh your ruck at the start of Team Assessment. If your ruck does not weigh 45/30 lbs., you will be performance dropped. You will have access to our scale prior to the commencement of Team Assessment. You and your teammate must both meet the PT test standards in order to be given the opportunity to continue to train. If either of you fails to pass any portion of the PT Test, you will not receive a refund and your experience will come to an end. * Push-ups, sit-ups, and the 5-mile run are done without a ruck. ** For the 12-mile ruck run, your ruck must weigh at least 45/30 lbs. at all times, not including water or food. Once the PT test is complete, the rest of Team Assessment begins. At that point, you will take all instructions from the Cadre. 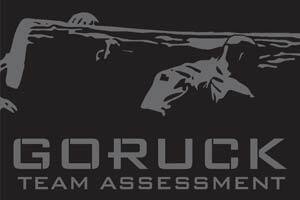 If you pass, you and your teammate will earn the GORUCK Team Assessment patch. It will never be for sale. Team Assessment is a team-based event. Our Cadre will enforce a standard adopted from our roots in Special Forces Assessment and Selection. Those teams who do not meet the standard at any point will be performance dropped at our discretion. Assessment begins with a gear inspection and PT test. Assessment registrations are non-transferable and non-refundable. The winning team earns the special Winners Team Assessment Patch. Finishers earn the Team Assessment patch. They will never be for sale.